Much easier today in that I was going to cycle to a meeting anyway! 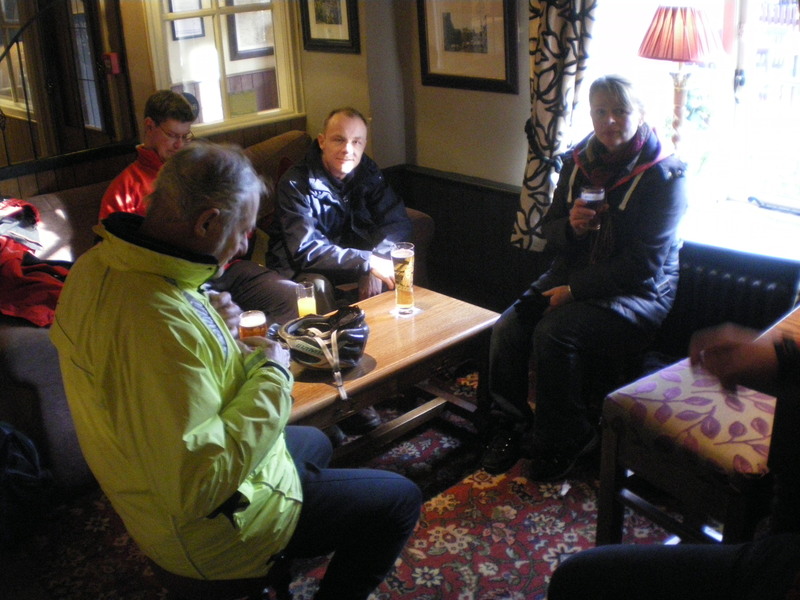 So the ride on Day 3 was to a committee meeting of CTC Northampton, the local member group of the UK’s Cyclists’ Touring Club. And via a little bit of shopping at my local supermarket, Waitrose in Kingsthorpe. I’m having a little bit of an argument / complaint / polite discussion with the supermarket. They have reduced the number of cycle-racks and moved them away from a window where they could be seen from the café inside the store. I’ve now had a couple of conversations with the customer service people and their manager. I took a photo and posted it on social media. 1 That’s a bit disappointing. I would have thought that Waitrose had a sustainability officer who should be encouraging and incorporating green efforts from their customers. Better signage might help and also better bike racks. CCTV, space for cargo bikes,panniers etc (I saw better examples of units at The London Bike show so will go check my blog for a reminder) Also removing the trolleys rather than the allocated space would be my expected approach, not the other way round. 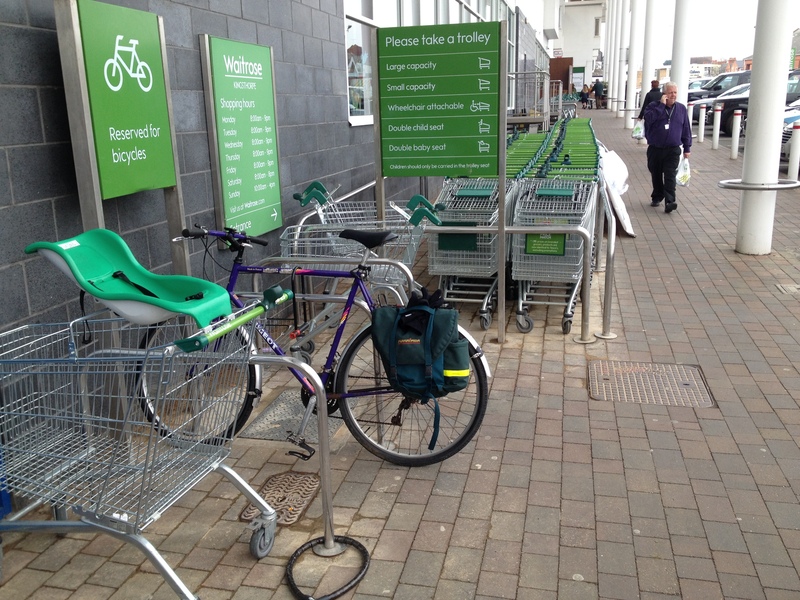 Waitrose do listen to their customers so perhaps if enough peeps requested cycle storage they might consider it? Here’s hoping…! 2 My local branch knew all about the free bike-trailer scheme operated by their Chichester branch! 4 No bike racks. No trolley scheme. Not up round ours, Nothing on the plans for the new store either, and it will be ‘wrong’ side of town centre race track DC too. grrr. 5 Bike parking at my local Waitrose is ropey as well. 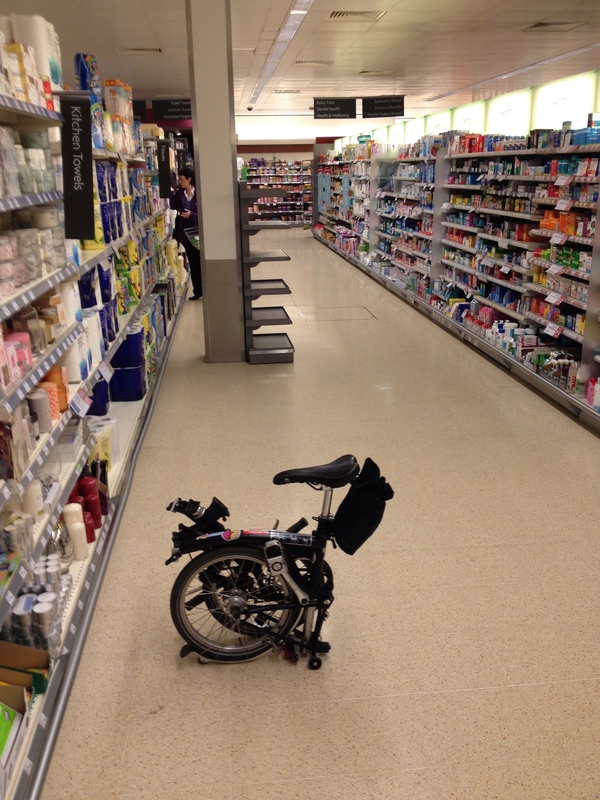 I don’t give a damn because I park my bike IN the trolley. Actually, if they were really serious about the sustainability thing, they should launch guarded bike parking. The assistant brought the manager to me and said to him, “This gentlemen always cycles here. Sometimes he brings his foldy bike in. Sometimes he parks a proper bike. He’s a regular customer.” To be honest, I hadn’t noticed the lady before! Loved the foldy/proper distinction she made! Today, I was on the foldy bke. Spoke to the manager (he was excited by the bike; I don’t think he’d seen a Brompton before; he was really interested!). The store was empty. And then it was on to my meeting where another member is taking a different approach. Instead of complaining to Waitrose, he’s been complaining to the County Council as the planning authority. When the shopping centre was built, he wondered, did planning permission include the provision of a certain number of bike racks? Can they be reduced by the supermarket without consultation? Have they broken the planning agreement? I hadn’t thought of that line of reasoning! 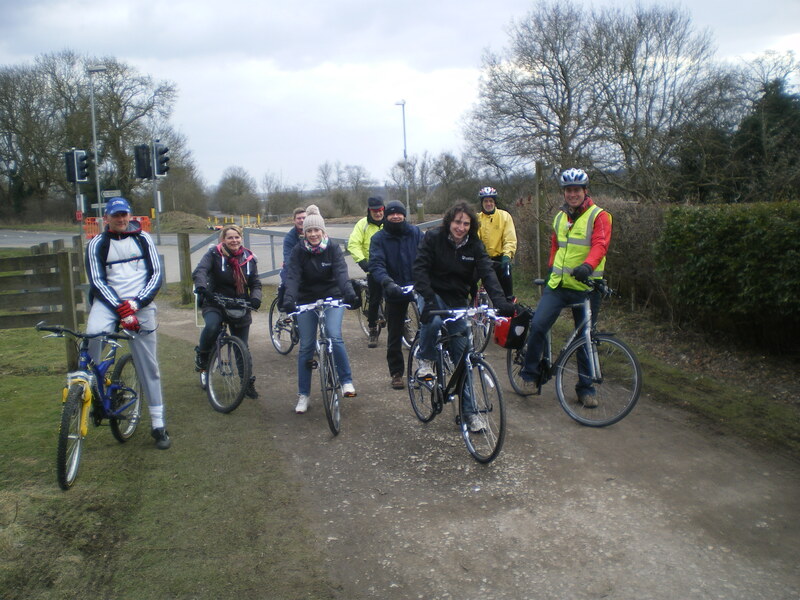 Really the meeting is about planning weekend rides and social events – and seeking opportunities to promote cycling. But, once in a while, our campaigning side comes out! 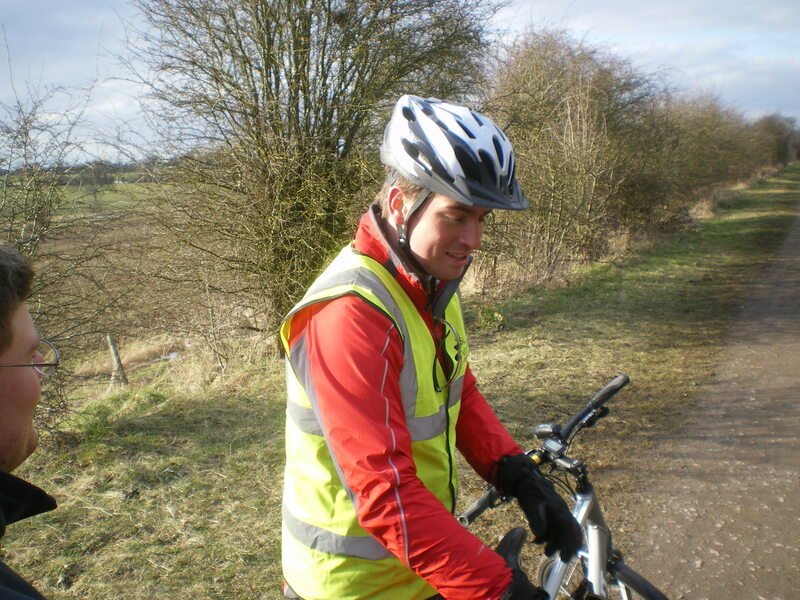 Summary Day 3 – Bike: Brompton, Distance: 4 miles, Total: 8 miles. Weather: cloudy evening with hint of rain after the meeting. Route here on RideWithGPS. I did ride home afterwards!